The Port of Los Angeles achieved record clean air gains in 2016 while also moving a record level of cargo, according to a report released Friday. The 2016 Inventory of Air Emissions report also found that the port surpassed its 2020 goal for reducing the health risk of its emissions. The report also found that since the port’s baseline year in 2005, diesel particulate matter emissions have fallen 87 percent, sulfur oxides emissions have fallen 98 percent, and nitrogen oxide emissions have fallen 57 percent. During 2016, the port moved a record 8.85 million 20-foot equivalent units, an 18 percent increase in cargo since the 2005 baseline inventory. As smoke from multiple wildfires chokes the air across California this summer, air quality has again become a hot topic in the Golden State. But despite the current bout of wildfires, the biggest source of smog in California remains the state’s 33.5 million vehicles. California is moving to promote air quality, especially in the wake of a new report from the National Parks Conservation Association that gives Yosemite, Joshua Tree, Sequoia and Kings Canyon an “F” for air quality. Ulla Reeves, clean air campaign manager with the NPCA, says all four iconic National Parks have unhealthy levels of ozone. Governor Jerry Brown set a goal last year of one million zero-emissions cars on the road by 2023, and signed a bill to make electric cars more affordable. Three years ago, the state mandated that 15 percent of cars sold in California be all electric, hybrid or hydrogen vehicles, beginning in 2018. Reeves says the Regional Haze Rule of the Clean Air Act needs to be tightened to force additional action on the issue around the country. ‘The U.S. Chamber of Commerce has criticized the regional haze rule as too stringent, and has made the claim the rule has stood in the way of construction of hundreds of new power plants. Los Angeles County’s air quality has improved but continues to be some of the worst in the nation, while the area’s groundwater and stormwater have excessive levels of pollution, a UCLA study said Tuesday, giving the county a “C+” grade for its environment. “Despite a strong recent history of environmental improvements, the county has a long way to go before joining the honor roll,” said Mark Gold, acting director of UCLA’s Institute of the Environment and Sustainability. The report rated the county based on its water, air, ecosystem health, waste, energy/greenhouse gases and quality of life. The county earned C grades in most of the areas, but scored Bs for waste and energy/greenhouse gases. In the waste category, however, the county received a “B/incomplete,” with Gold saying there is no data tracking how much waste is being recycled. “Despite the fact that all cities in the region comply with state solid waste management laws, we don’t have the data to determine who much waste is recycled or diverted from disposal in landfills,” he said. “As a region we need to decide what the most important environmental measures are that we want to track and determine how we will do so regularly,” she said. The report also found that despite large increases in water conservation, the county imports more than half of its water, and the per-capita water use is more than double that of Europe and Australia. It also found that the county’s per-capita electricity use is among the lowest in the nation, but much of that power came from coal. Air quality has improved substantially over the last 45 years, but the region still frequently violates federal standards for ozone and particulate matter, the report found. The South Coast Air Quality Management District (SCAQMD) is urging southlanders to sign up to receive the agency’s residential no-burn and other air quality alerts via email. The air quality board hopes the program will increase compliance of bans on burning wood when air quality is at risk. The bans are issued as part of the Check Before You Burn program, designed to protect public health by reducing harmful wood smoke from residential wood burning this winter. Under the program, mandatory no-burn alerts are issued when fine particle air pollution is expected to reach unhealthy levels. During a no-burn alert, residents in affected areas are not allowed to burn wood in their fireplaces. “How many years have gone by and we didn’t even know the damage [Exide] was doing,” said Jovita Morales, one of the homeowners whose soil was removed. While not admitting any culpability, Exide agreed to pay for blood lead tests for area residents who are concerned about their exposure. Testing, conducted by the county health department, started in April. So far, only 450 people have taken advantage of the free blood tests, but none those tested “required medical intervention,” according to the county. The low number of tests has prompted the testing period to be extended for the second time until Jan. 30, according to county health officials. “We believe Exide is responsible” for remediating the damage, he said. “For that extended period of time, this [assessment area] is probably the place their emissions ended up,” he said. “We are aiming to get at least five homes [clean] before the holidays,” said Marxen. “Our target is to get a least 10 to 12 homes cleaned by the third week of January,” he added. “There was some confusion because the letters they sent were addressed to me,” he said in Spanish. Lucia Flores, 72, said she initially didn’t want to go through the process of having her soil tested because she wasn’t sure what would be expected of her as a homeowner. “It took me a long time to grow these plants for someone to just come and cut them,” she half-jokingly said. Residents do not have to be at their home while the weeklong clean up takes place, in fact they can opt to stay elsewhere at Exide’s expense, according to DTSC. “I worry about my granddaughter who lives here,” she said in Spanish, as she watered the plants in her yard. 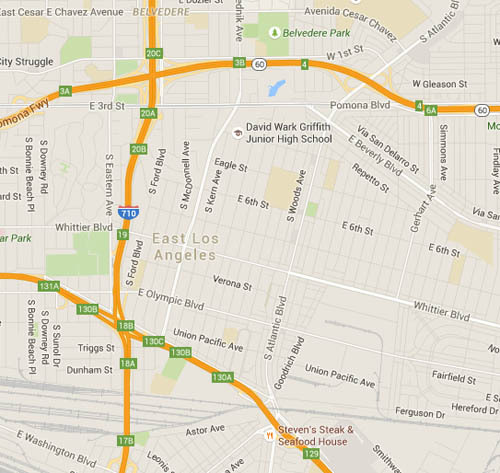 “I have heard the [Exide] plant is bad for our health,” she said. Exide’s Vernon plant has been closed since March as it installs enhanced systems to comply with California’s air quality standards. The company has invested $35 million on environmental, health and safety measures since 2010. 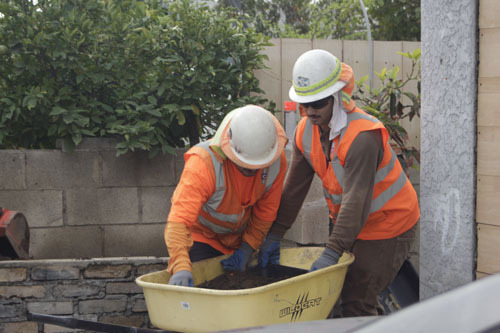 “We recognize the community’s concerns and are confident the Department’s tough new order provides strong regulatory oversight for cleaning the identified residential properties,” said Thomas Strang, Vice President of Environment Health and Safety for Exide. “Exide is committed to operating a premier recycling facility and working collaboratively with regulators to perform all work necessary to reach his goal,” he said. 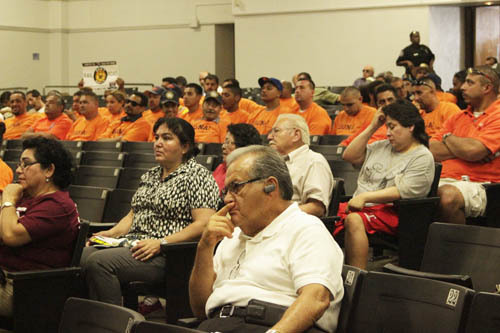 “Wherever we find contamination that we can link to Exide we are going to make them clean it up,” said Marxen. Residents in the two assessment areas can contact DTSC for information about cleanup at (844) 225-3887.